A memorable corporate holiday party begins with a reputable venue and tasty menu. The holiday season is here, as a business owner or HR manager you are probably thinking about organizing a corporate holiday party. Are you feeling the burden of planning a corporate holiday party? Is your business located in Queen, Brooklyn or NYC? Then rely on Siricos! 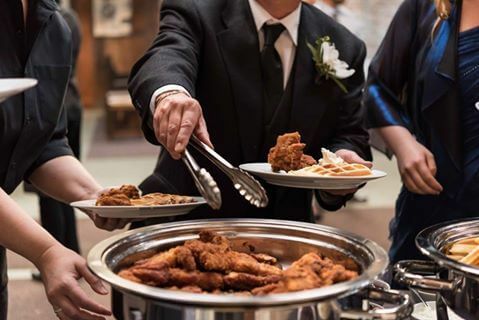 Sirico’s Caterers is one of the leading and most well-known caterers in Brooklyn, NY. We are proud to offer exceptional menu options combined with top-notch service to New York’s corporate community. Give your employees and guests a memorable corporate holiday party at an elegant venue that will be the hit of the season! Sirico’s professional chefs will create an amazing menu of tasty options like chicken, beef, pork, lamb and pleasing seafood dishes, with garden fresh options that will leave your employees and guests satisfied. By offering a wide range of stations, you will give your guests the choice of enjoying delectable cuisine from NYC’s best chefs. This will eliminate the wait on a long buffet line. Your corporate holiday party guests and employees will enjoy quicker access to a variety of tasty dishes with custom plating. If you want to limit heavy or fried foods, then Sirico’s veggan chef will make sure your guests are offered the fresh grown ingredients they want with tasty fresh ingredients to please any palette. For sure, your guest and employees will love and enjoy the crunchier, lighter and healthier fare. Our professional chefs are capable of serving the best international cuisines that will make your corporate holiday party a memorable and exotic one. Whether it is classic Italian favorites, Mediterranean dishes or Persian dishes, our experienced chefs will create a menu that will satisfy the most discerning tastes and leave the attendees content and happy. Today, the bacon-infused menu is considered to be one of the top trends of event catering in Brooklyn, NY. This menu includes bacon-wrapped scallops and vegetable, meat dishes prepared with bacon or bacon add-ons to custom dishes.irico’s Caterers’ facility is a modern and festive venue in Brooklyn, NY where you can organize a memorable corporate holiday party. Whether you want to have a twilight or daylight affair, Sirico’s spacious and elegant venue will prove to be the best choice. 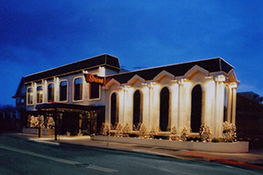 Sirico’s facility has a unique dining environment, lighted dance floor, vaulted ceiling and a 50 foot long skylight that creates a wonderful setting.